Such is the social media headline for a recent article in The Atlantic. Most of the reactions to this on Twitter involved exclamations like “yikes,” “gross,” “nasty,” “I am so grossed out right now,” and so on. Of course it’s understandable that such a revelation would make some people upset, since raw fish is quite far from the category of foods we perceive as processed and artificial. However, upon a closer glance, this article is simply pandering to that modern fear of over-privileged foodies who are terrified of ingesting anything that sounds like a chemical, even though everything is chemicals. So what exactly is this ‘artificial orange colouring’ that is supposedly used to make farmed salmon fillets appear palatable? It’s called astaxanthin, an organic molecule that naturally occurs in the diet of wild salmon. This molecule belongs to a class of compounds known as carotenoids — organic pigments found in plants and other photosynthetic organisms. In the ocean astaxanthin is produced by microscopic algae and passed up the food chain by zooplankton, small fish, and crustaceans. In general the diet of marine predators is rich in this compound, but salmons, trouts, and chars are special because they accumulate deposits of astaxanthin in their muscles. Hence the pigment lends their flesh the quintessential salmon-pink hue. The same molecule is also responsible for the orange colour of cooked lobsters and shrimp. Actually fish feed is carefully crafted to strike a balance between meeting the nutritional needs of the salmon and maximising sustainability of the feed, but sure, calling it a hodgepodge is easier. 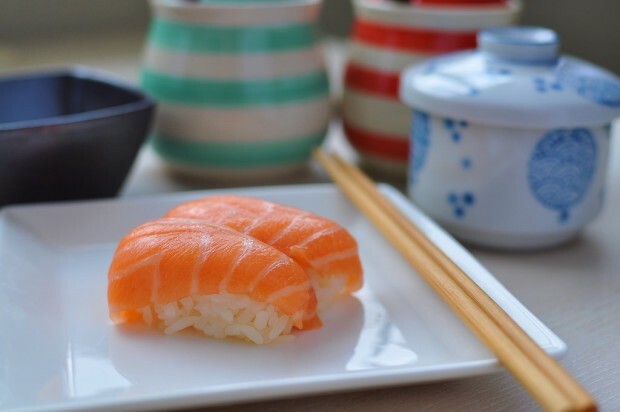 However, it is true that salmon feed does not include shrimp, krill or other crustaceans which would be a source of astaxanthin — and hence the need to incorporate the compound, because not only would nobody believe that the pale flesh at the fish counter actually belongs to salmon, but asthaxanthin is also a powerful antioxidant involved in the health of the fish. Since humans are good at chemistry and have figured out how to cheaply create the compound in a lab, most of the astaxanthin fed to salmon in farms is synthesised. Its molecular content is identical to the stuff produced by algae, but the atoms are arranged somewhat differently (this is known as an isomer). Unless you have an ideological issue with man-made compounds, the artificiality of astaxanthin is largely insignificant. If you want to learn more about the colour of farmed salmon and the implications of this practice, there is an excellent article from the Seafood Monitor cached on the web archive. You will gain much more from it than you will from the hodgepodge that is The Atlantic piece. 365 day science blogging project on March 22, 2015.